Okay, I hope I don't lose any readers over this one, but I'm having a good time with my 12 Days of Wrestling Christmas. And I must credit my friend Chad for the suggestions. I was leaning toward a turtle neck theme for the turtle doves, but Chad reminded me of a couple turtle gimmicks from back in the day. The picture to your left is an actual wrestling gimmick from 1992. It's Brian Hildebrand aka Mark Curtis, a wrestler who eventually turned referee. He wrestled in the Smoky Mountain Championship Wrestling group as Kowabunga. 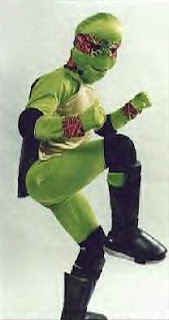 A gimmick dedicated to the popular Teenage Mutant Ninja Turtles. I didn't really follow SMW back in the day, so all I know about is what I've read online. And there's not even a whole lot there. I can't find anything on Youtube, I was hoping to link something. I can only imagine back then when wrestling was a bit more cartoon than athletic event that Kowabunga was probably over with fans. Maybe. Next up, Steve "the Turtle" Weiner. He's a wrestler in Chikara, a group that runs out of Pennsylvania. I've seen some of their shows on DVD. They put on a decent product, but it's kinda cheesy. Of course wrestling and cheesy go hand and hand. 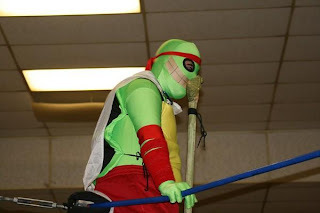 The Turtle won the gimmick of the year award among voters on the Burning Hammer website back in 2009. Again, I don't know a whole lot about Steve or his gimmick. I just watched a promo of his on Youtube. He's a little out there. But I think to be involved in wrestling, you have to be a little out there. Judging from this video, he seems to be almost like a Eugene/George Steele/Norman the Lunatic type character. Yes, I'm calling the turtle slow. Someone must like him, as he won the gimmick of the year award. I'm guessing he's a marketable face, with lots of turtle type merchandise to sell between matches. So, so far one the first day of Christmas my true fans brought to me: a Red Rooster in a Wrestling Ring.